An inland Estonian may well ask: what, an aster in July, and isn't it a garden flower anyway? 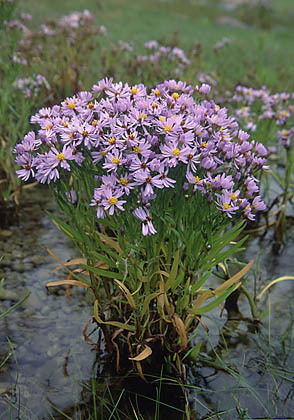 The sea aster grows at the sea shore of the mainland coast as well as the islands. It prefers a soil impregnated with salt water, and with a high water level we can see the plant growing "feet in water“. We are used to the luscious blooms of the garden asters; the diameter of the sea aster flowers is only a few centimetres. There is a single row of pale purple-blue ray florets; the disc florets in the centre are yellow. The leaves are narrow and rather fleshy, similar to other seashore plants that grow in a “desert climate“ and have to be economical with water reserves.